Deep vein thrombosis (DVT) is a blood clot in one of the deep veins in the body. 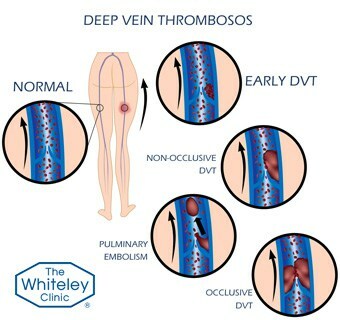 A deep vein thrombosis (DVT) is an abnormal clot that has formed in the deep veins of the leg or pelvis. They have become feared by the general public for very good reasons. In the short term, large DVTs can move from the leg or pelvic veins and go through the venous system travelling into the heart and then lungs. This is called a pulmonary embolism (PE) which is a very serious medical condition and can even be fatal. In the long term, even when DVT’s have been successfully treated, the scar tissue formed in the deep veins can lead to a problem called post thrombotic syndrome (PTS). This PTS can result in discoloured, uncomfortable and swollen legs which may even end in leg ulcers. Although most DVTs are small, harmless and resolve by themselves, it is also true that a great many DVTs never get diagnosed and are often passed of by patients, doctors and nurses as “muscle sprains” or other leg aches. Without a venous duplex ultrasound scan performed by a specialist vascular scientist (who is able to scan even the smallest veins in the calf), one cannot be certain as to whether a DVT is present or not. As such, it has become essential to diagnose DVTs using the very best duplex ultrasound machines by experienced vascular scientists. These specialists are able to perform very detailed and accurate scans to ensure that any DVT is identified and treated accurately. Screening blood tests and quick duplex scans performed in a matter of minutes can exclude some major DVTs and regularly miss DVTs that might cause significant problems if left. A Duplex ultrasound scan should also be used to identify when the DVT has fully resolved enabling a recommendation as to when Warfarin or other anticoagulation can be stopped safely. Traditionally doctors have given a standard course of Warfarin, usually 3 or 6 months, and then stop anticoagulation without checking whether the DVT has actually resolved or identify if it is has caused any damage to the deep veins. As part of The Whiteley Protocol®, we not only use duplex ultrasound scanning to accurately diagnose DVT but also to check that any treatment has been successful to ensure that each treatment regime is tailored to each individual patient. Finally, it is essential to find out whether there is a cause for a DVT. In many cases there is an obvious cause – such as surgery, dehydration or a long flight whilst on the oral contraceptive pill. However, recent interest has focused upon patients who get a DVT for no known reason – a so-called ‘unprovoked’ DVT. Such patients need to be checked to make sure they do not have a hidden cancer as this can be a major cause of an unprovoked DVT.